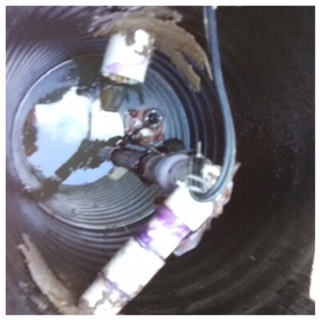 In Alpharetta, Action Septic Tank Service replaced an outlet baffle in the tank shown. The outlet baffle is the heartbeat of your septic system. Its purpose is to prevent floating scum from entering and clogging the drainfield. When an outlet baffle is missing from the septic tank, we either see it lying on the bottom of the tank or find that one has never been installed. Also, we often come across concrete baffles that have rotted away. 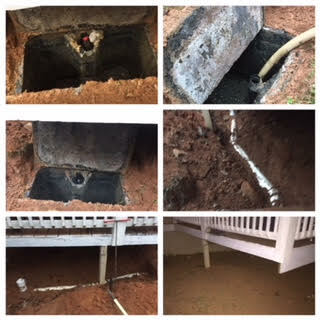 To fix, we install new outlet baffles using PVC sanitary tees. Many times, we add effluent screens to the outlet baffles for extra protection. Effluent screens prevent larger solids from passing to the drainfield. For more septic information and service, call Action Septic Tank Service at 770-922-1434 and visit Action Septic Tank Service. Action Septic Tank Service is located in Alpharetta - Milton, GA in North Fulton County. For 20+ years, we continue to provide residential, commercial and industrial septic and sewer service for North Atlanta, Metro Atlanta and surrounding areas. We are open from 7:00 AM – 10:00 PM daily and also provide emergency service. 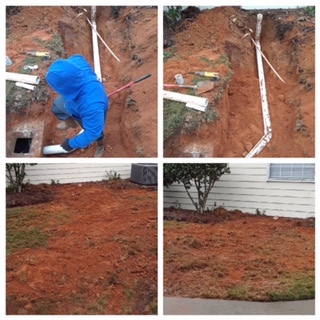 In Roswell, Action Septic Tank Service repaired this septic system. The photo grid attached shows some of our work. Before the repair, the septic tank was overfilled due to the clogged filter. The tank was an open style and had no divider. Having a filter present caused it to stop up too quickly and created problems. So, we removed the filter from the septic tank. We also found an object stuck inside the old, cast iron mainline. To fix, we replaced the entire line with PVC and added a clean out. An overfilled septic tank leads to backups. Other signs of septic failure include gurgling pipes, slow drains and toilets, foul odors, surfacing effluent, patches of greener grass, depressions in the yard, and the sounding of a septic alarm. Happy Holidays From Action Septic Tank Service! In Dunwoody, Action Septic Tank Service repaired this residential septic system. The photos show some of our work. On this repair, the main line needed to be replaced. The existing line was improperly put together and had gaps along the inside. The line was blocked with tree roots, detergents and grease. To fix, we replaced the main line with PVC. This got the system properly flowing again. The main line carries all water from your house or business to the septic tank. Inside the tank, the solids settle to the bottom, the oil and grease float to the top, and the wastewater makes up the middle later. The wastewater then exits the septic tank and goes out to the drainfield. 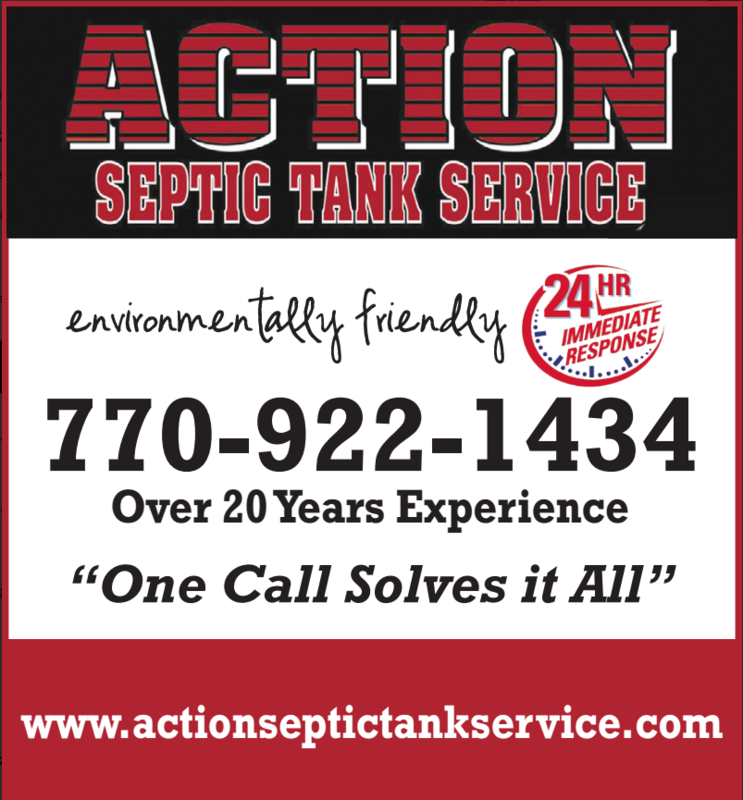 For more septic information and service, call Action Septic Tank Service at 770-922-1434 and visit www.actionseptictankservice.com. 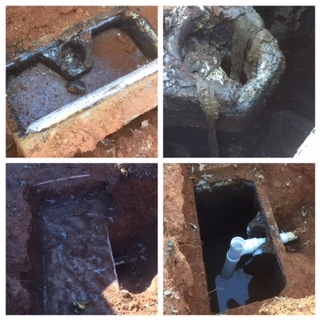 In Roswell, Action Septic Tank Service repaired this septic system. The photo grid shows some of our work. Prior to the repair, the system was backed up. We dug down to find the mainline was blocked with tree roots. To repair, we pumped the overfilled septic tank. We replaced the outlet baffle and the line from the tank to the drainfield. We also replaced the mainline from the tank to the cast iron. To complete the work, we installed a new septic lid with a riser. In Milton, Action Septic Tank Service installed a 1/2 HP sewage pump inside a basin. The photo attached shows the pump setup. When the wastewater reaches a certain level, the pump begins to operate. It passes or grinds the sewage and moves it from the basin to the septic tank. The effluent then exits the tank and goes out to the drainfield. Automatic sewage pumps have a float switch. The float switch controls the pump and triggers it to start when the water gets to a certain point. 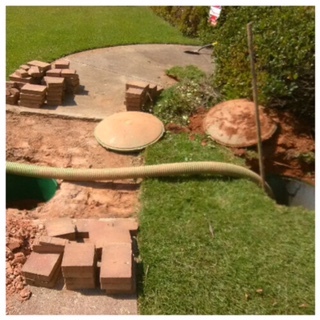 In Alpharetta, Action Septic Tank Service found the outlet end of the septic tank and filter underneath the sidewalk. See the attached photo. To service, we removed part of the sidewalk so we could access the septic tank. We recommended adding a manhole or moving the sidewalk to avoid future digging. It is important to plan your landscaping and hardscaping. Keep trees and shrubs away from your drainfield. Run downspouts and irrigation lines in another direction. Avoid planting gardens nearby. Consider the location of your septic system before adding decks, patios, sidewalks, walkways, courts, ponds, pools and other hardscapes. Action Septic Tank Service is located in Alpharetta - Milton, GA in North Fulton County. For 20+ years, we continue to provide residential, commercial and industrial septic and sewer service for North Atlanta, Metro Atlanta and surrounding areas. We are open daily from 7:00 AM – 10:00 PM and also provide emergency service. 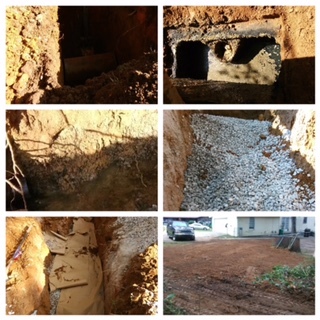 In Milton, North Fulton County, GA, Action Septic Tank Service installed a French drain to repair a drainfield. Check out the attached photo grid to see some of our work. A French drain system uses a gravel-filled trench and perforated pipe to divert the flow of effluent away from your home or business. The water seeps downward through the gravel and into the drain. The gravel also acts as a filter to help prevent solids from entering the drain. French drains disperse the water into the soil. This helps to keep your septic system from overloading and eventually failing. For more septic information and service, please call Action Septic Tank Service at 770-922-1434 and visit our website, Action Septic Tank Service. Action Septic Tank Service is located in Alpharetta-Milton, GA in North Fulton County. For 20+ years, we continue to provide residential, commercial and industrial septic and sewer service for North Atlanta, Metro Atlanta and surrounding areas. We are open daily from 7:00 AM – 10:00 PM and also provide emergency service. 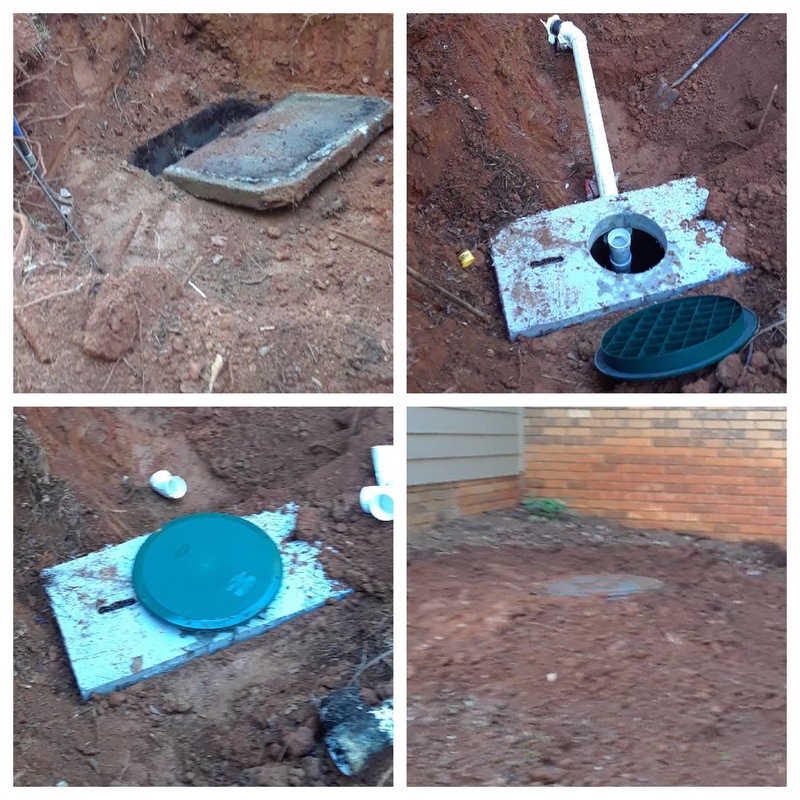 In Roswell, Action Septic Tank Service added a distribution box to the septic system. The attached photo shows effluent correctly entering the distribution box. The distribution box receives effluent from the septic tank and evenly distributes it to the drainfield. Gravity works to level the distribution box as the water flows out to the drainfield lines. This helps to prevent drainfield flooding. Distribution boxes must be properly installed and inspected at the time of your septic service. The equal distribution of effluent will extend the life of your drainfield and keep your system running smoothly. Action Septic Tank Service is located in Alpharetta-Milton, GA in North Fulton County. For 20+ years, we continue to provide residential, commercial and industrial septic and sewer service for North Atlanta, Metro Atlanta and surrounding areas. We are open daily from 7:00 AM - 10:00 PM and also provide emergency service. In Milton, GA, Action Septic Tank Service repaired this drainfield. 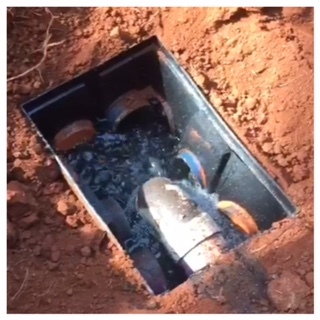 The attached video shows the water improperly running back into the septic tank. To fix, we performed a crossover. We connected the broken drainfield line to a good line so that all pipes were correctly flowing. For optimal performance, it's very important to protect your drainfield. Keep trees, shrubs and hardscapes from being planted nearby. Avoid parking or driving overtop of your system. Run downspouts and irrigation lines away.